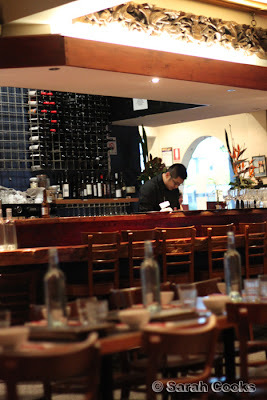 Good food is hard to find in Camberwell. As for good Asian food? It's nearly impossible! But not completely. Located opposite the Rivoli cinema in the Camberwell / East Hawthorn area, Monk and Me is one of my family's regular haunts for a quick weeknight meal. In fact, once upon a time, my brother used to work there (this was before he jetted off on his Japan adventure - Konnichi-wa, Daniel-kun!!!) As I've mentioned previously, I don't usually blog restaurants I visit frequently because I tend to eat quickly and order the same thing every time - favourites here include the chicken kapitan curry and the sambal spinach. (Yes, sambal can make even spinach taste addictively good!) So when Monk and Me's manager, (and my bro's friend!) 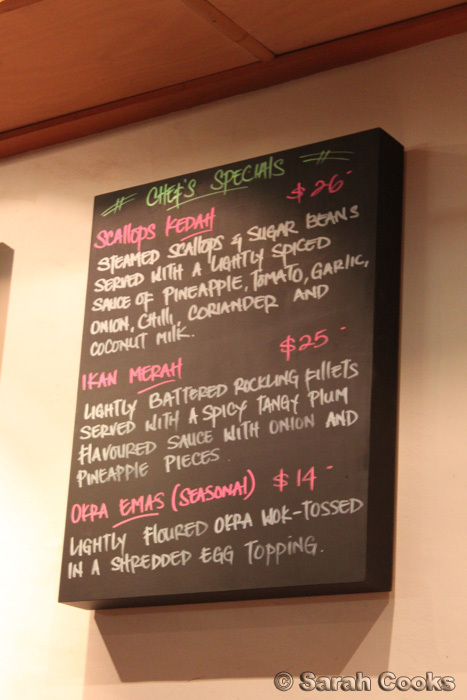 Clement, invited me along to try out their new specials, I thought it would be a great chance to try something new! 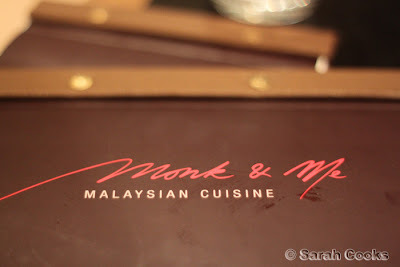 Monk and Me comes from the same people who brought you Cinta Ria, and you can expect the same spicy Malaysian food and funky settings. First new thing we tried was cocktails! 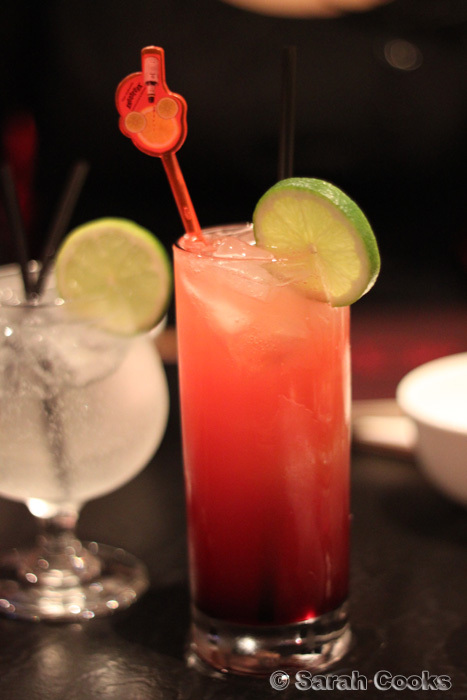 We went for one classic - Singapore Sling, and one signature - Drunken Monk. The Singapore Sling was exactly what you'd expect: sweet and refreshing, but woo-hoo that Drunken Monk was strong! It's a mixture of gin and bacardi with lime and lemon. Make sure you order some serious carbs if you're getting one of them! We got a couple of entrées to start - udang goreng and some classic curry puffs. For those of you who are unfamiliar with the Malay language, "goreng" means fried! And it is your key to Malaysian deliciousness. 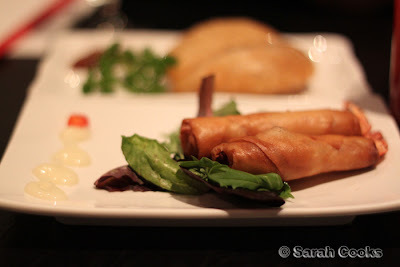 The udang goreng were prawns, coated in a spicy sauce, wrapped in spring-roll pastry and deep fried. It's kinda like a spring roll but without any cheap starchy filler, just pure prawn. The curry puffs were "better than the ones you make, Sarah" (quoted from Sandra). Slight bruise to the ego, but I'd have to agree with her, not least of all because mine are baked and these ones are deep-fried! I especially like the hot sambal that comes with them. Being that Sandra doesn't eat seafood, and 2 of the dishes were seafood based, we ordered a couple more, and asked Clement if the kitchen could do mini versions so that we could try them all. Would have felt pai seh with so much food, and pah sung if we couldn't finish it and it went to waste! Happily the kitchen were able to accommodate. Let's have a look at the dishes one-by-one. 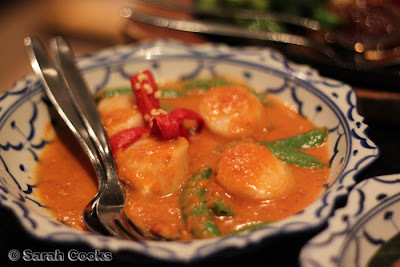 Scallops Kedah - This dish included plump, juicy scallops in a mild coconut-based sauce. Scallops are my favourite seafood ever, and it's always nice to try them prepared in a new way. I loved that there was a lot of sauce to go around as well. Scallops Kedah (mini) - Steamed scallops & sugar beans served with a lightly spiced sauce of pineapple, tomato, garlic, onion, chilli, coriander and coconut milk. $26.00 for a full serve. Ikan Merah - The ikan merah was quite similar to sweet-and-sour fish, but with a much punchier sauce. 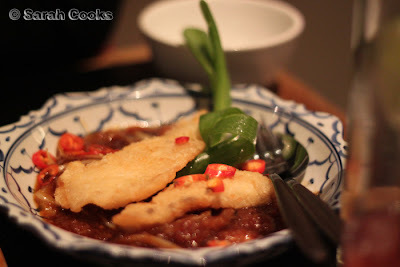 I often find sweet-and-sour dishes too sweet, but this one had a good amount of chilli the counter the sweetness. 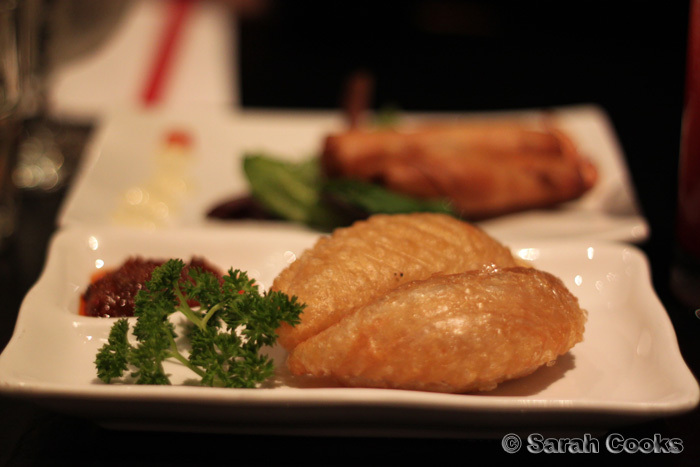 Ikan Merah (mini) - Lightly battered rockling fillets served with a spicy tangy plum flavoured sauce with onion and pineapple pieces. $25.00 for a full serve. 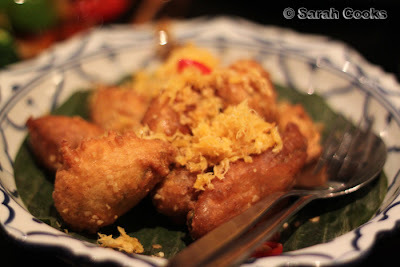 Okra Emas - The next dish was my favourite of the night - deep fried okra! I'd previously only had okra in curry, so it was a nice change to try it battered and fried. Okra itself is pretty bland, but the batter had a nice salty kick to it, and the shredded egg topping was rich with the flavours of coconut and garlic. I almost regretted asking for a mini-version! Okra Emas (Seasonal) (Mini) - Lightly floured okra wok-tossed in a shredded egg topping. $14.00 for a full serve. 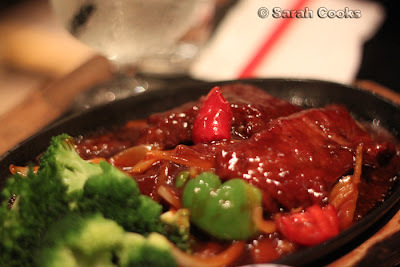 Sizzling Tenderloin - We ordered this from the regular menu. I'm glad it came with some brocolli, as we'd seemed to have ordered quite a bit of fried food! I only had a little bit of the beef, but it was nice and tender. Sizzling Tenderloin (mini) - wok-tossed tenderloin steak fillets in a plum based sauce with onion, red and green capsicum served on a sizzling plate. $28.50 for a full serve. Kung Poh Chicken - One of the standard dishes we order at any Asian restaurant. Monk & Me's version is good - not blindingly hot, not too greasy, and with a generous amount of chicken. Would have loved a few extra cashews though! 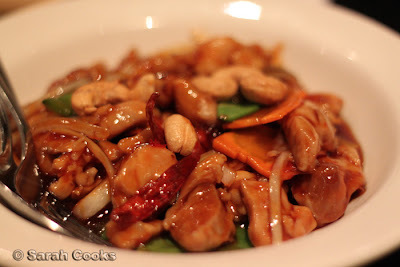 Kung Poh Chicken (mini)- Wok-tossed diced chicken in a blend of spices, fresh ginger roots, dried chilli, carrot, snow peas, onions, spring onions garnished with cashews. $22.50 for a full serve. They do have a good dessert menu - banana fritters, sago pudding, pandan crepes, ice-creams/sorbets and sticky-date pudding. Obviously, after all that food we were way too full to have any dessert, but from previous visits I can recommend the sticky-date pudding and the pandan crepes! A big thank-you to Clement for the invitation to come and try out the new dishes! Sarah and Sandra dined as guests of Monk and Me, with thanks to Clement. i'm yet to try anything aside the curry laksa as yet... LOLz. i better go back and have a decent eat there =). 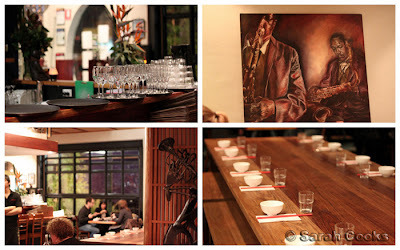 The one and only time I've gone to Monk & Me was about 5 years ago. I think it's time and gave it another go! I read your blog a lot (and comment occasionally as 'C'. Hope you can pop by some time. "Good food is hard to find in Camberwell"